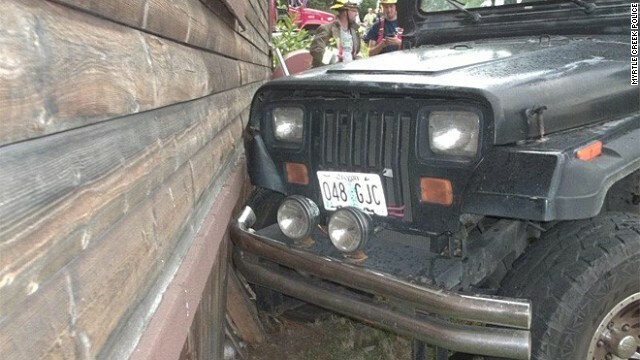 A diaper-clad toddler crashed a Jeep Wrangler into a neighbor's house in Oregon - then scampered home, sat on the couch and watched cartoons, authorities said. The 3-year-old boy was under his mother's watch in Myrtle Creek when the incident happened last week, Police Officer Kevin Taggart said. She was not paying attention to him and he found the keys, got inside the car and knocked it out of gear, according to Taggart. A witness called 911 after seeing the child rolling by in the Jeep before hitting the house. Sensing he was in trouble, the toddler jumped out of the car and dashed home. "An officer went to the boy's home - and the boy was sitting on the couch watching cartoons like nothing ever happened," Taggart said. Police cited the mother for failure to supervise the child following the incident Tuesday. The homeowner and the child's mother have made a civil arrangement on the repair to the house, authorities said. "We want to encourage parents to remember that children are very crafty in finding ways to get in trouble and for parents to be very vigilant," Taggart said. Before the accident, an officer saw the boy sitting in the car and warned a relative to keep an eye on him, authorities said. At the time, when the officer knocked on door, a relative watching the child was sleeping.